Tomorrow will be the fifth anniversary of The Deep End. During the past five years I have enjoyed studying Scripture and writing posts based on the Truth of God’s Word. As always, He has been exceedingly gracious to allow me to continue. I pray and hope that what readers find here will be challenging, thought-provoking, comforting, and profitable, and that the Lord Jesus will be magnified and exalted. The Lord is certainly the Prince of Peace, but I have learned that He is also passionate and zealous. These things are not mutually contradictory, but the result is that – more often than we think – God deals in the reality of clashing perspectives and strong emotions. It’s one of the lesser-known facts of Christian theology that the God of peace sometimes works through violent conflict. Are you struggling to believe the truth about your sin? You need to know that the Bible says that your sin is against God (Romans 3:23; Psalm 51:4), and that God, Who is just, righteous, and holy, will not let your sin go unpunished. Have you faced the truth about eternity? Your life here on earth will not be the extent of your existence. Your soul is going to leave your body when you die, and you are going to face God, Who will either welcome you into Heaven or cast you into hell. Do you find it difficult to believe the Bible’s promise that the gift of salvation is a free gift that you must receive by grace through faith alone? You cannot earn it or pay for it or add anything of your own merit to it, and you do not deserve it. If you are struggling with any or all of these truths, do not give up. Believing in Christ can be a time of violent struggle for many people. You will either struggle violently to get away from the drawing power of the Holy Spirit, or you will submit and be drawn to repent of your sin, and trust Christ. You may even be struggling violently against your own pride, or peer pressure, or some lie which has led you to believe you don’t need a Savior because you are not in trouble. The fact is we are all sinners. We all deserve God’s wrath. None of us deserve to go to Heaven. The Kingdom of Heaven will suffer (“put up with”) your violence if you have the attitude of a desperate sinner in desperate need of a Savior. Salvation is a gift that Christ offers to you, but an offer alone does not make a gift. An offer must be received to be a gift. Will you receive it today? You may have seen this on television. It is one of my favorite images from nature documentary footage. In the frigid waters off the coast of South Africa a great white shark (by some estimates weighing close to one and a half tons) comes bursting up through the water’s surface, breaching explosively with its torpedo-shaped body, clenching a terrified fur seal tightly in its razor-sharp serrated teeth and powerful jaws! The answer lies in the seals’ inability to see what needed to be seen, and to hear what needed to be heard. A seal-lover, anticipating the attack, could scream at these fur seals, and even wave his arms frantically as a warning of what is coming from below, but it would do no good. Christians who share the Gospel with unbelievers can sometimes feel a little of the same frustration. Lost sinners know that they are sinning. Why can’t they grasp the danger of God’s impending judgment and wrath? Like fur seals, they are suffering from a type of sensory deprivation. According to Scripture, the little “g” god of this world, Satan, has blinded – not the eyes, but the minds – of unbelievers. They are swimming obliviously through a sea of worldly conformity, and no amount of screaming, gesticulating, logical reasoning, pleading, or emotional manipulation is going to convince them to swim immediately to the safe harbor of God’s love. What hope is there, then? The only light bright enough to shine into the heart of a person whose mind has been blinded is the glorious light which God has placed in our own hearts, and which can shine like a spotlight on the crucified and resurrected face of Christ the Lord. Some of us reading this were given our sight just in the nick of time to avoid – not a great white shark – but the place of the condemned before the Great White Throne of God’s judgment. Now, it’s our turn to aim the darkness-defeating, sight-giving light straight into the minds of the other seals. Their Satanic affliction is not a cause for frustration; it is an opportunity for God to get glory. And after him was Shammah the son of Agee the Hararite. And the Philistines were gathered together into a troop, where was a piece of ground full of lentiles: and the people fled from the Philistines. But he stood in the midst of the ground, and defended it, and slew the Philistines: and the LORD wrought a great victory. This is one of the briefer battle scenes in the Bible, but it is one of my absolute favorites. It is found in a passage of Scripture where the Holy Spirit is giving an account of some of the heroic deeds of “David’s mighty men.” We don’t know all that much about Shammah, but he appears to have been a farmer as well as a warrior. There he was one day, out in his field of lentils. When I originally taught this lesson in Sunday School, I called it “Shammah and His Pea Patch,” and, boy, did I pat myself on the back for being clever. However, a quick Google search reveals that I was not so original after all. Anyway, there he was, when suddenly some Philistines, who had “gathered together in a troop” showed up. We have three enemies in the Christian life: Satan, our flesh, and the world. If you find yourself under attack from any one of these you could be in for a long day, but there are many days when all three of these enemies gather themselves into a “troop” to concertedly attack you all at once. When that happens you may be in for a really long day! Shammah’s name meant “astonishment,” and I would imagine that he was astonished, but his actions didn’t necessarily reveal it. The peas that Shammah was cultivating on the land that the Lord had given him were not for the Philistines. They were for Shammah’s family and the Israelite people. Imagine spending long hours and days and weeks toiling in the field, plowing, planting, watering, weeding, sweating, guarding, watching, praying, preparing to harvest, and then here comes the enemy trying to profit off your labor! We don’t know if the Philistines wanted these lentils to feed their own troops, or if they just wanted to destroy them to try to starve out God’s people. Either way Shammah was having none of it. Notice that Shammah’s people fled, but he stayed to fight. There are going to be times when you have to stand alone for the Lord (which is only true in a sense, because He is still with you). Notice that Shammah didn’t scheme and mince and devise some worldly battle plan. Nor did he try to compromise or negotiate. He took his stand “in the midst” of his field. Open to ambush from behind? Yes, he was. Subject to being surrounded? Sure. Without cover to help funnel his enemy into a more manageable position? You bet. But Shammah didn’t care. Enough was enough. This was the Lord’s pea patch, and Shammah would defend it or die trying! The Bible says that Shammah defended his crop and slew the Philistines. The Bible also says that the Lord wrought a great victory. All glory must go to God when we stand on the ground that He has given us by the power of His might and defeat our enemies (who are also His enemies) by His strength. Lord, grab us, arrest our hearts, and get our attention. Make us tremble before Your Word. I Samuel 14 contains the account of Jonathan and his armor-bearer taking on the Philistines. Saul was the king of Israel. This was the first time God’s people had a king over them. The people wanted a king. They wanted what everybody else had. God wanted them to be different. Why would they want a king when they already had the King? God faces the same competition today in our own hearts. The Jewish people wanted what the Amalekites had and what the Egyptians had. We want all the things the world offers, but we think, “It’s okay – I’ll still ‘call’ God my King.” If God is your King, you don’t need what everybody else has. In Chapter 13 of I Samuel, the Bible tells us that the Israelites depended upon the Philistines to sharpen iron. Now there was no smith found throughout all the land of Israel: for the Philistines said, Lest the Hebrews make them swords or spears: But all the Israelites went down to the Philistines, to sharpen every man his share, and his coulter, and his axe, and his mattock. They did not have their own smith, and in fact there were only two swords among all the Israelites. You can probably guess who had these two swords. Saul, the king, had one, but he was not using it, because he was resting under a pomegranate tree when he should have been in the battle. Jonathan, Saul’s son, had the other sword. It is a great testimony to the grace of God that Saul could have a son like Jonathan. Jonathan was the kind of son any father would want to have. The Philistines were reprobate enemies of God and His people, and God wanted them wiped out. Christians today have a foe, an enemy, an adversary: Satan. God has plans for your life and Satan has plans for your life. These plans are far different. Satan has been watching you. He knows your weaknesses. He knows what you like to watch. He knows what you like to hear. He knows where you like to go. He has traps set, and he a three-fold mission. He’s on a mission to kill, steal, and destroy. He wants to steal your blessings. He wants to take your life. He wants to destroy your testimony. He has designs on your children and your grandchildren. Every day he is tirelessly at work doing everything he can to wreck our lives. He hates God. He knows all about what happened on the Cross. He understands the authority and the power of Christ better than you do. And he will do anything possible to rob God of His glory. Like Jonathan, you have a foe to fight. Are you in the battle? Do you believe that the battle is worth fighting? Getting your blessing stolen is bad. Getting killed is worse. Having your testimony destroyed is the worst, because it robs God of His glory. These Philistines were in a garrison: a heavily fortified military camp. They had soldiers and spoilers. They despised the Hebrews. They were mocking God and God’s people. They were encamped between two sharp rocks. The Hebrew army was on the run – afraid, disorganized, under poor leadership from Saul, hiding in caves. But Jonathan was a soldier. A soldier’s job is to fight. “Hardness” is being able to get through life – and through life’s battles – without a lot of the comforts that civilians enjoy. The Christian life is a battle, and soldiers do not go carelessly or casually into a battle. Soldiers on a battlefield are not concerned about frivolous entertainment or the latest fads. -We know more about the stores at the shopping mall, than we know about Nehemiah and the temple wall. -We know more about our MP3 player, than we know about the High Priestly Prayer. -We know more about LSU, than we know about Elihu. We know more about what’s happening on the red carpet than we know about what happened on the Cross of Christ! May God help us. “No man that warreth entangleth himself with the affairs of this life; that he may please him who hath chosen him to be a soldier.” Don’t get so tangled up in worldly amusements and affairs that when the Commander tells you to get in the battle, you can’t get yourself untangled. The young boy walked across the church parking lot, tossing a ball in the air and catching it as it fell, casually wandering toward a busy highway. One man noticed this, and, being a religious man, he began to wring his hands, pray, and ask the boy politely to stop, to change directions, or at least to pay attention to where he was going. The boy remained oblivious and kept moving toward the highway. Another man observed the boy, and, being a caring man, he ran in a flat-out sprint toward the boy, dove through the air, and crashed into the boy with a flying shoulder tackle. Both he and the boy landed, just short of the path of a speeding truck, in a ditch filled with mud, weeds, and broken glass. The boy was shaken up, crying, cut, and bruised, but still alive. The two men had taken drastically different approaches. One man appeared loving and polite, but his passivity was evidence of a callow cruelty toward the boy. One man appeared hateful and rash, but his willingness to act was evidence of a true love for the boy. Christians are not supposed to just “have” friends. They are supposed to LOVE their friends. Christian love is more than just a “feeling.” It always involves action. If I have a friend who is walking toward destruction, my “secret love” for this friend will be of little help. However, a loud verbal warning during a face-to-face confrontation, even though it may cause hard feelings, could do a world of good. I need to have a loving willingness to batter and bruise (and then bandage) my friends, instead of a weak-willed sentimental desire to give them little kisses good-bye as they head for damnation. Some Bible words can be hard to understand. If you are going to get a grip on the idea of “propitiation” or “justification” (Romans 4:25, 3:25), you had better be prepared to stay up all night. There are other words, however, which are extremely self-explanatory. Take the word “everlasting.” Something that is “everlasting,” is something that…(all together now)…LASTS…FOR…EVER. When God says something is everlasting, it may blow our minds a little. After all, most things in this world have a start and a stop, a beginning and an end. The sun comes up; the sun goes down. Plants spring up and grow; plants wither and rot. People are born; people die. In God’s realm of eternity, however, there is no true end or beginning. So while the conceptualization of “everlasting” may be difficult, the basic sense of it is not. This is a great encouragement to true Christian believers and a great condemnation to those who have rejected the Gospel of Jesus Christ. Unbelievers will experience punishment forever. However, believers have the assurance of knowing that their salvation may never be lost. A currently popular television talk show host grew up attending traditional Christian churches, holding to fundamental Biblical teaching and preaching. She recently explained her rejection of these beliefs by referring to something, at the age of 28, she heard preached in church: The God of the Bible is a jealous God. This struck her as very strange. How could God, Who is all-powerful, and Who owns everything, be jealous of human beings? What a tragic misunderstanding, and what a shallow view of Scripture. Oh, God is jealous, alright. But He is not jealous of what people have or what they are able to do. He is jealous because of the love He has for his Own people. We might say He is jealous over His people, not of His people – the way a loving and faithful husband would be jealous over anything that would tend to steal his wife’s affection away from him. God loves His people very much. And although we would rather hear about the love of God, we must not ignore the fact that God reserves wrath for the enemies of His people. Did you know that, even though God is love (I John 4:8), He also hates (Psalm 11:5)? Recently, my wife and I visited California. On the flight I was reading Nahum Chapter 1, and looking down at the tops of the clouds, which the Bible calls “the dust of his feet,” and I got to thinking about some of the ways the Lord shows His righteous anger, and His power over His creation. Most people, when asked to quickly name the opposite of “love,” will blurt out, “hate.” But this is incorrect. The opposite of love is not hate. The opposite of love is indifference. And our loving and just and jealous God is anything but indifferent. Lemuel Briggs was a farmer in Mendocino County, California, in 1895. He had a lamb and two sons. 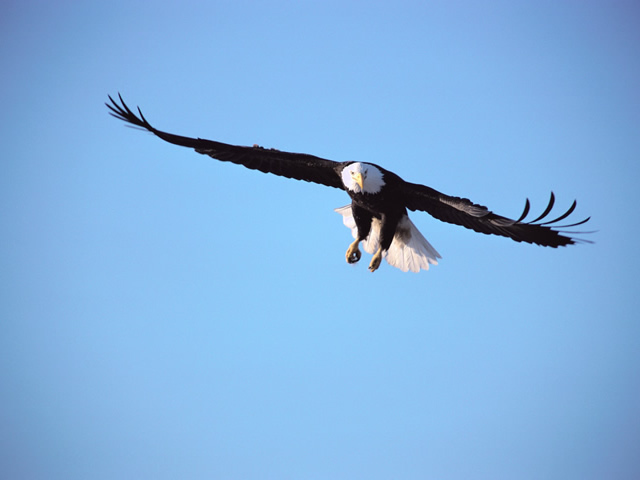 Bald eagles were not as scarce in those days as they are today. One day, a bald eagle left its nest in the mountains near Mr. Briggs’s farm, soaring on wings that measured over eight feet across, and carried off Mr. Briggs’s lamb. He was furious. He sent his sons, Willie, aged 13, and Eddie, 11, up into the mountains to find the eagle’s nest. They obeyed. However, as they went up the narrow mountain path, they neared the eagle’s nest before they realized it, and the eagle attacked. It circled around them, swooping in relentlessly, talons tearing and beak pecking. The attack ended with Eddie permanently scarred, having lost an eye. One can only imagine the grief felt by Lemuel Briggs every time he saw his boy’s patched and scarred face. In the Bible, there was a tradition among the Jewish people of cutting off their hair or shaving their heads during times of devastating grief. As God’s people faced the chastening of God for their idol-worship and spiritual adultery, the prophet Micah used a bit of holy irony to drive home what would have been a sore point. The irony has to do with his description of their children as “delicate.” Parents who are not strict with their children when it comes to Bible study, church attendance, and Christian conduct, may gloss over the suggestion that they are spoiling them. However, when the enemy comes to take them captive, it will quickly become apparent that children who were too “delicate” to be subjected to discipline, are likewise too delicate to withstand the rough treatment they will experience at the hands of their captor.